I had a couple of russet potatoes that I picked up from the store, the other day. I did it not quite sure what to do with them yet. I was thinking baked potato, maybe. Nah, what about chili fries? No, soup! I don’t know. And then it dawned on me… I’m just gonna make ’em all! Jeepers! I had no idea how involved it was! Talk about intense pre-planning! I kinda felt like Robert Irvine from Dinner Impossible! But I have to admit, I had fun. And the thing even turned out to be souper delicious! Even without the butter and sour cream, in fact! And thank you for noticing! Yes, my blog is snowing and this soup is just perfect for my dinner tonight. By the way, it really is cold and snowing this very moment, here in my neck of the woods. Okay, here’s some tips! There are two ways you can bake your potatoes. If you simply place them in the oven rack, naked, the skin will turn out crispy. If you wrap them in foil, steaming will occur, hence, it will keep the skin soft. It’s your choice. I like it crispy. Also, to emulate a deep fried texture, the fries need to be soaked in water and boiled before baking them. It’s still not exactly the same but it’s as close as you can get. Not bad, actually. And finally, a great and no-fuss way to mash potatoes is to use an immersion (stick) blender. As opposed to a hand mixer, that is, which can be a messy proposition. Now, get cookin’! Here’s the recipe for 1 serving. Don’t be afraid to experiment and put your own stamp on it. 1) The baked potato – Scrub clean the medium potato while rinsing under cold tap water. Use a fork to pierce the potato as deep as you can and all around. This will allow for steam to escape and prevent the spud from bursting open and making a mess inside your oven. Wipe it dry with a paper towel. Now, coat a little olive oil around it and sprinkle with a little salt. Place on a baking tray and stick in the oven for 1 hour turning over halfway through. 2) The fries – Peel the small potato and cut lengthwise into thin slices. Put in a pot with cold water and bring to a rapid boil. Once the water starts to boil, turn the heat off and drain the fries. Dry on a paper towel and place on a separate baking tray. Coat with a little olive oil and dust with grill seasonings. Place in oven along with the baking potatoes. They must have been baking for about half hour by now, so turn the baking potato over if you haven’t already. 3) The soup – Meanwhile, cook diced turkey bacon in the same pot with a little olive oil. When done, transfer to a plate lined with paper towel to drain off excess oil and set aside. In the same pot, saute some minced garlic and leeks adding a little more oil if needed, for a few minutes. Add a cup of chicken stock, stir until boiling and then, turn the heat off. 4) The mashed potato – By this time, both the baked potatoes and fries should be almost done, if not already. Take both trays out of the oven. Cut open the baking potato, scoop out the flesh and place in a mixing bowl. Add a sprinkle of parmesan, fresh ground pepper, some diced bacon, chopped chives and a splash of milk and start mashing. Transfer the mashed potato into the pot, turn the heat back on to medium low and stir until warm. Add more stock, if needed. You want the consistency of a thick creamy soup. 5) Putting it all together – Place the fleshed out potato skin in a soup bowl and ladle the soup in it. 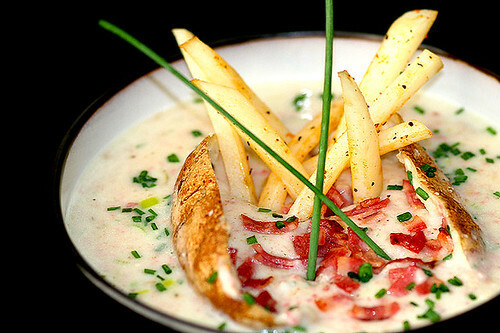 Dip a few pieces of fries (serving the rest on the side) and garnish with more bacon and chives. Enjoy this hearty meal quick, while the skin is still crispy! Scrub clean the medium-sized potato while rinsing under cold tap water. Use a fork to pierce the potato as deep as you can all around. baking for about half hour already, so turn the baking potato over if you haven’t already. minutes. Add a cup of chicken stock, stir until boiling and then, turn the heat off. consistency of a thick creamy soup. and garnish with more bacon and chives. Enjoy this hearty meal!